St. Gregory Palamas, the New Chrysostom, in the Church of the Holy Three. Saint Gregory Palamas reposed in Thessaloniki in 1359 and was officially canonized nine years later in 1368 by his disciple and biographer, Ecumenical Patriarch Philotheos Kokkinos. Philotheos Kokkinos also wrote about miracles performed during the lifetime of Saint Gregory, as well posthumous miracles. 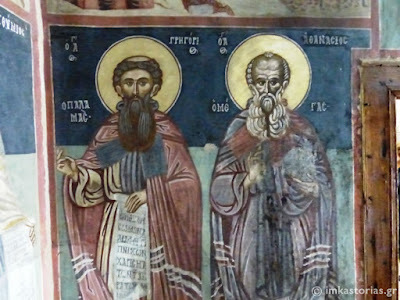 Among these posthumous miracles are two miracles that took place in Kastoria. In one of these, we read how on account of the miracle performed by Saint Gregory for a woman named Zoe, clergy and notables of Kastoria had an icon made of him, built a church in his honor, and began to commemorate him yearly, all before his canonization in 1368. Thus the first icon and church dedicated to Saint Gregory Palamas were located in Kastoria. Unfortunately, today we do not know the location of this church or icon. 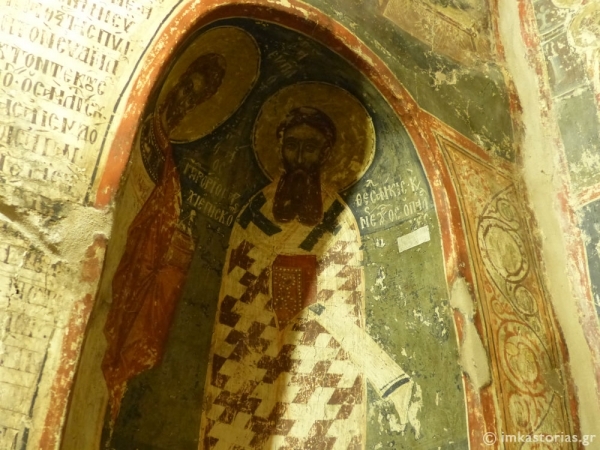 a) the Church of the Holy Three (Gurias, Samonas and Habibus the Martyrs), built in the 14th century, the fresco is located in the Holy Sanctuary, at the Diakonikon, and the iconographer has named it "the New Chrysostom". It dates to around 1400 or 1401. 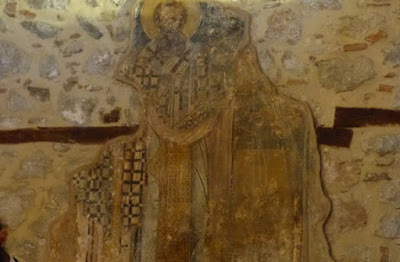 The epithet "New Chrysostom" suggests that he is equal in dignity and standing with Saint John Chrysostom, and it is only reserved for his earliest depictions (such as the 1371 depiction in Vatopaidi Monastery). Also, in the time of Saint Symeon of Thessaloniki, the feasts of Saint John Chrysostom and Saint Gregory Palamas were celebrated together on November 13th, and the Divine Office of Palamas is similar to that of Chrysostom. b) the Church of Saint John the Theologian, which is a chapel of the Monastery of Panagia Mavriotissa, and the fresco is located in the Holy Sanctuary where he is depicted with other Holy Hierarchs. It dates to 1552.
c) the Church of Saint George of the Mountain has two full body depictions of the Saint, within the nave and in the narthex, and one of these date to the second half of the 14th century while the other the second half of the 16th century; the first is around the time of the canonization of Saint Gregory, though it is not known if it is from before 1368 or after. The older one also bears the epithet "New Chrysostom". d) the Church of the Most-Great Generals (Pammegiston Taxiarchon) in Apozari, where the fresco is located in the Holy Sanctuary, dating to the 16th century. This fresco is one of the only frescoes that have survived in this church. 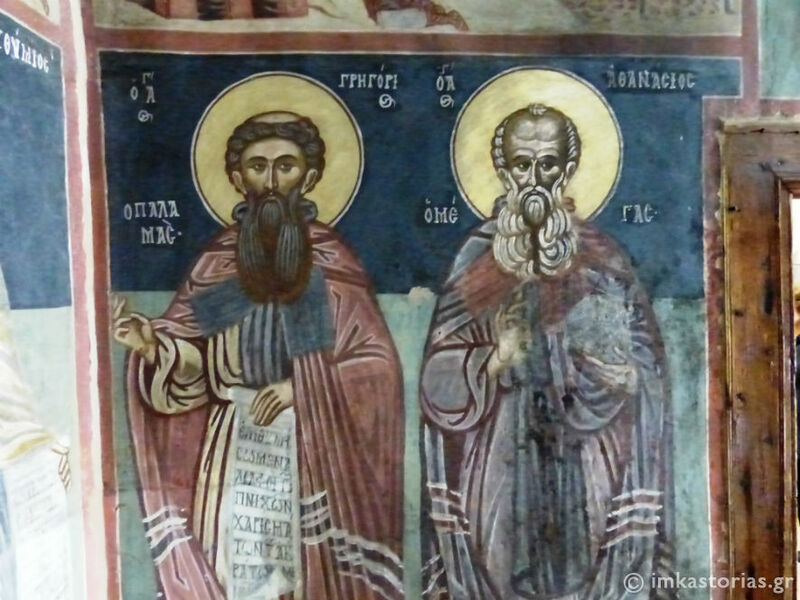 Below are the two miracle accounts written by Saint Philotheos Kokkinos that Saint Gregory Palamas performed in Kastoria posthumously, before 1368. St. Gregory Palamas, in the Church of the Most-Great Generals. Zoe was a noble and decent woman from Kastoria. An intestinal obstruction caused her to suffer from painful abdominal distensions and vomiting of blood. For five years she underwent treatment for this grave disease, but medicines and doctor's skills proved ineffective. The patient despaired of them and life itself. During this time, she continued to hemorrhage which constantly debilitated her system. However, by the grace of God, she had a strong constitution and good appetite, which greatly aided in sustaining her life during those long and bitter years. Ultimately, however, her body succumbed, causing her to remain bedridden for two more years. Seven years passed since the disease began to manifest itself. Locally, Zoe then heard of the splendid report of the great Gregory's miracles which took place not only in Thessaloniki. With faith, she resolved to take refuge in the divine power of the Saint. According to the Apostle James' words in Holy Scripture, she called the presbyters of the Church that they might pray over her and anoint her with oil in the name of the Lord (Jas. 5:15). After this was done, she requested that they make an entreaty to Saint Gregory. She was unable to stand with them and chant, since she had lain motionless for two years. Nonetheless, she ardently besought his help and favor. Then - O the paradoxical works and wonders of Christ! - she, who was physically depleted, arose while the others were in the midst of their prayers and chanting. This took place not after a year or a day or even an hour, but at that very moment. All turned their eyes towards her and beheld her robust and strong, without a trace of the former disease. The curing of her incapacitating disease is to be compared with the miracle that Christ performed when healing the paralytic at the pool by the Sheep Gate (Jn. 5:2). When Zoe was healed of her hemorrhaging, this too was much like the miracle performed by Christ upon the woman with the flow of blood (Mt. 9:20). Thus, after years of suffering, Zoe rose from her sickbed, through the mediation of Christ's disciple and initiate, Gregory. On account of this miracle, the lovers of God, clergy and notables of Kastoria, had a holy icon of the Saint made and gloriously celebrated the day of his commemoration. Although it was before the Saint's official glorification in 1368, the Kastorians dedicated a church, the first of many other churches that were to be constructed in honor of the radiant disciple of Christ, Gregory. St. Gregory Palamas, in the Church of Saint George of the Mountain. The elderly and noble-minded monk Ephraim was from Kastoria. In his own words, he related that, for two years, it was necessary for him to travel to Thessaloniki. Once, while on the road during his return trip, a thorn punctured and penetrated his right foot, causing him pain for several days. "Then," he said, "I do not know how it happened, but an unbearable pain suddenly appeared in my other foot. To add to my troubles, the pain interrupted my sleeping and eating. After several days, the foot became inflamed and very swollen as a leather bag. The swollen foot became perforated with more than forty opening that discharged pus. The scars may be seen to the present day. After eighteen months, the swelling did not subside. All medical treatment and medicines proved fruitless. I despaired of all these things, even this life of anguish." What was the outcome? "I heard from some locals and those coming from Thessaloniki of the extraordinary miracles performed by the wonderworker Gregory. I sincerely believed every word. I heralded the Saint as a pillar of the Church, a teacher of piety, a receptacle of holiness and virtue, a worker of divine signs and wonders, and as one replete with apostolic power and grace. I then made my own entreaty to him regarding my illness. Unable to stand, it was necessary that I lie down. I prayed, as well as I could, with warm tears. I besought the Saint for my former health. I promised him that if he restored me whole that I would go to venerate his sacred tomb in his city of Thessaloniki. There, and everywhere along the way, I would proclaim the marvelous works of Christ provided through him. My compunctionate prayer included this and many other pleas. After praying, it was evening and the hour to rest. As I slept, I beheld a monk garbed with the customary symbols of the episcopacy; that is, he wore a Cross on his head and a bishop's stole. He entered my cell and, after taking a seat, addressed me, saying, 'How are you?' I then proceeded to show him my swollen and punctured foot. I told him of the longstanding pain and exhaustion. He then took my foot with both his hands, to collect the swelling and to push the infection out. He then said, 'Do not sorrow further, for you have nothing to trouble you anymore.' He departed after administering this compassionate benefaction upon me. During no other time in my life was my sleep as sweet or as peaceful as during this vision. The following morning, when the brotherhood was summoned for prayer and psalmody, I also desired to attend. With only a cane, I went into the church, to the sudden wonder of all present. I was questioned by the brethren and declared unto them the miracle and the cause of the paradoxical cure. All that heard were awestruck and astounded by my account. Eight days after the divine visitation, I fully recovered. I went into the church at Kastoria that possessed the icon of wonderworker Gregory. I venerated and bowed down to the icon, rendering up my heartfelt thanks. I then returned to the monastery and the brethren. It was necessary, I thought, to fulfill my vow to the 'new physician'. However, with winter fast approaching, walking, for an old man as myself, was difficult. Hence, I decided not to take the road to Thessaloniki, thinking that there was some other way that I might fulfill my vow to God and His servant. I planned to invite the presbyters of the church and my fellow monastics to perform a service of celebration. I disclosed my plan to my fellow cenobites and we made ready for a rich and splendid holiday." However, this alternate settlement of Ephraim's vow was not blessed by the Saint, because he had promised to proclaim the Saint's miracle in Thessaloniki and everywhere along the way. Thus, before the day of celebration was over, Ephraim succumbed to a dangerous and violent fever. Once again, his foot swelled and caused pain. Ephraim immediately understood the reason for his relapse. Ephraim confessed his sin against the Saint, scolding himself for having breached their agreement, because of his carelessness and for the sake of convenience. With many supplications, he besought the Saint's pardon, promising to fulfill his vow. Then, in a remarkable manner, the infection broke up and drained that same day. Shortly thereafter, Ephraim completely recovered. Walking on his own two feet, he entered the city of Thessaloniki and venerated the tomb of the Saint. In keeping with original promise, he enthusiastically declared to all within the Saint's church the miracle that he was vouchsafed.